If your back has been bothering you, you might chalk up your pain to a bad mattress, overdoing it at the gym, or throwing out your back while lifting something heavy. All of these are considered “mechanical” causes of back pain, which means that there’s been a disruption in the way the components of the back (the spine, muscle, intervertebral discs, and nerves) fit together and move, according to the National Institute of Neurological Disorders and Stroke. However, there’s another — and much less well-known — kind of back pain that is considered to be inflammatory back pain, not mechanical. This kind of back pain, which is a form of inflammatory arthritis, occurs because your immune system is mistakenly attacking the joints in your spine. This back pain is known as ankylosing spondylitis or axial spondyloarthritis. Ankylosing spondylitis typically affects the bones in your lower spine and where your spine connects with your pelvis (known as the sacroiliac joints). There’s also inflammation where ligaments and tendons attach to bone, such as the Achilles tendon at the ankle. The most common AS symptoms are on-and-off flares of pain and stiffness in the lower back, hips, and buttocks. If you suspect you could have AS, there are some key clues based on your back pain and other symptoms you should pay attention to. If you answer yes to most of the following questions, it’s likely that your back pain is inflammatory and not mechanical. Did your back pain start when you were younger than age 40? Does your back pain wake you in the middle/second half of the night and prevent you from falling back asleep? Does your back pain feel better if you exercise or move around? Does your back pain feel worse when you rest or sit for long periods? Does your back feel stiff first thing in the morning for at least 30 minutes? Does your back pain feel better when you take NSAID drugs, such as ibuprofen? Has your back pain lasted, on and off, for more than three months? Does your back pain occur with any other symptoms that may seem unrelated, including eye inflammation, inflammatory bowel disease, psoriasis, or pain in your peripheral joints, such as your ankles or knees? When you call your primary care doctor or a rheumatologist for an appointment, let the doctor know you suspect your back pain could be inflammatory. Be prepared to explain why based on your answers to these questions. This can help speed up your getting an appointment and direct your doctor to conduct certain tests to help get to the bottom of the cause of your back pain. Why Does It Matter If Your Back Pain Is Inflammatory or Mechanical? It matters a lot. If your back pain is mechanical, the best way to treat it is often to allow time to let things heal, or to try physical therapy. Lifestyle changes such as losing weight, quitting smoking, improving posture, and exercising more can help too, by allowing better circulation to the discs in the back and relieving pressure on the spinal column. Steroid injections can be used to relieve pain that’s not getting better with physical therapy and lifestyle changes; surgery is considered a last resort. If your back pain is inflammatory, however, ongoing inflammation from your immune system will continue to cause pain even as you attempt to treat your back pain with the above options. Newer medications, such as biologic drugs that tamp down the activity of the immune system, provide more targeted and effective treatment for AS. If you attempt to treat inflammatory back pain with treatments that soothe mechanical back pain, you won’t get better. Even worse, ankylosing spondylitis is progressive, so you will become more debilitated. Over time, ankylosing spondylitis can cause the vertebrae in your spine to fuse together, resulting in permanent damage and a stooped posture. One of the most important things you can do to ensure a prompt and accurate diagnosis is to keep track of your back pain symptoms. You can use an app like ArthritisPower to document when your back pain gets worse and when it eases up. However, keep in mind that there is no single test or red-flag symptom that can confirm an ankylosing spondylitis diagnosis. It’s a clinical judgment from your doctor, based on inputs from a physical exam, blood tests, imaging, and your self-reported symptoms. 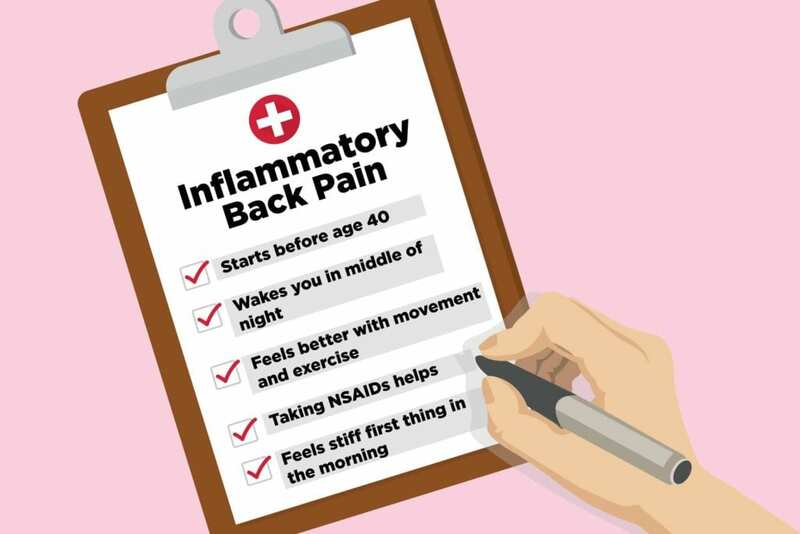 The above symptoms of inflammatory back pain, coupled with other results such as X-ray or MRI evidence of inflammation or damage to the sacroiliac joints or the presence of the genetic marker HLA-B27 on a blood test, make it more likely that your back pain is ankylosing spondylitis. You should also be aware of these other symptoms of ankylosing spondylitis in addition to lower back and hip pain.